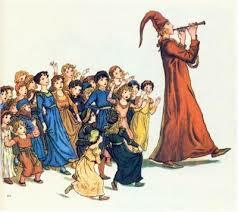 Lemmings, the plague and a Children’s Crusade: The Pied Piper explored. The medieval infestation of rats which caused the bubonic plague, is thought to be foundation for the narrative The Pied Piper of Hamelin. The story tells of the deliverance of the town of Hamlin from the infestation of rats by a mysterious Piper dressed in coloured clothes. Perhaps drawing from the migratory behaviour of lemmings, the story has the Piper lead the vast host of rodents out of town and into the sea where they drowned. When the towns people do not show sufficient gratitude to the Piper, he proceeds to lead their children away, never to be seen again. This week in news, Scientists have published findings that it was not rats that originally caused the bubonic plague in medieval Europe, but in fact fleas carried from Asian gerbils. From 1347 onwards, the plague effectively wiped out over 30% of the European population. However, the first record versions of the Pied Piper date back to 1300, some 50 years before the plague even broke out in Europe. “It is 100 years since our children left. Theories around what happened to the 130 children of Hamlin vary, but an interesting account points to a Children’s Crusade. Reputedly started in 1212, a German boy called Nicholas, a shepherd from the Rhineland in Germany, possessed with an extra-ordinary eloquence, tried to lead a group of children across the Alps and into Italy. Claiming that he had been visited by Jesus, he had been told to lead a Crusade to peacefully convert Muslims to Christianity. Through a series of supposed portents and miracles he gained a considerable following, including possibly as many as 30,000 children. He led his followers south towards the Mediterranean, in the belief that the sea would part on their arrival, allowing him and his followers to march to Jerusalem, but this did not happen. Sadly two out of three travelers died on the journey, and those who did not were offered citizenship by local authorities. Nicholas himself, refused to admit defeat, continued to Rome where the Pope encouraged him and his followers return to their families. Nicholas did not survive the journey home, and back in Germany, his father was hanged by angry parents whose children and family members had also perished.